Gavin and Yvonne were (are) devoted to the English language in an uncommon way. There is a language for Pagans and Wiccans, a jargon — Wicca words. There are concepts that people quibble over and words that are more universally accepted. One way to address these ways is to look at some meanings of how we frame our spirituality. Deity is at the center of all that we do. It is unknowable, unnamable, indefinable. The more we talk about Deity, the more we limit the Deity construct to what we, as humans, can imagine. Deity is limitless. Because we have limited imaginations, and do not wish to limit the Deity, we celebrate lesser deities. For us, we believe that these can be any deities in the pantheon you choose, the ones you are comfortable with. You like Kali-Ma – get to know your girl. Get to know her well, not all of her aspects are loving or kind. You like Isis and Osiris? Sure, celebrate them. Use the tenet of Power Through Knowledge to get to know Isis and Osiris well so that you can celebrate them to the best of your ability. This means more than a five-minute internet search to get to know your chosen construct. Celebrating a club of lesser deities to support the Ultimate Deity has been called syncretic monotheism. You are not limited to a white guy with a beard, but your knowledge and spirituality can grow through your empowerment. This concept has been beaten to death (uh oh – that might be harmful, even to the words of the concept). People wish to use “harm none, do what you will” to control your behavior. One of the great joys of Wicca is that it is very much your personal faith path. You can practice “harm none” to the best of your ability. A common example of this is that people act judgmental about whether or not eating meat is within the Rede. That is a very personal decision. Also, when you consider whether or not you eat meat, you may also wish to consider what is on your feet or in your home. Do you not eat meat because you wish to not harm animals, but you have a new car with leather seats? Do you use not eating meat as a way to get attention at public events or public dinners? Consider “harm none” carefully to work it for you and your spiritual growth. You may be a person who practices Harming None who still eats meat and smokes. If you smoke outside, your second-hand smoke is not harming another person in your home for instance but might still be harmful to the environment. We all act in ways that are harmful, but some actions are easier to correct than others. In the US, driving to work is almost a given, so many, many people have a much larger carbon footprint in the US that might be a necessary evil – in some places not driving to work is much easier than it is in the rural US. Again, it is up to you on your journey as you grow spiritually. Because so many people feel negative connotations of “power,” I prefer to use the term empowerment, which is a more modern, politically correct Wicca word. The more you learn, the more empowered you are. The more you learn, the more you grow, the more likely you are moving forward on progressive reincarnation. Refer back to the opening remark about Gavin and Yvonne’s devotion to language. Language is key, using good, accurate language is even better. The more you know, the more empowered you are to know what you want for your spiritual growth. If anything is true about this path, it is that you do not grow by turning over responsibility for your growth to a spiritual leader that might be leading you down his or her path instead of your own. Now that we have the inter-webs, you have so many learning opportunities at your fingertips. The world truly is your oyster for you to learn as much as you can. The more you learn, the more you grow. (Did I write this already?) Yvonne talks about this lifetime as a classroom, where you learn lessons and pass or fail those lessons. When you pass those lessons, you move on to harder lessons, just like school. It’s not much of a reward, but eventually you reach your spiritual goal and get to choose to start over or rest. Spiritual growth has its own drawbacks and hurdles, but we happily imagine it is worth it. And because we try to be timely, let’s address a modern issue. Suicide interferes with the path of progressive reincarnation and our learning opportunities. We block our personal empowerment if we commit suicide, either slowly through smoking or eating poorly, or quickly with a rope. If this thought crosses your mind, be brave, be empowered, reach out. We lose too many wonderful people who are not aware of their own value to suicide every day. They get to return here (reincarnate) to try again until they get through that life lesson without trying to commit suicide. Let’s start with the Law of Three because this one bothers me. The Law of Three suggests that what you put out to others will come back to you three times. Gavin was a physicist at heart, so the Law of Three did not make sense for him considering how energy and physics work. However, this is an esoteric “law.” It’s possible that this kind of energy does not work this way, quite simply. We do not know for sure. Philosophers and pundits have good ideas, but we do not know. We might never get to know while we are on this plane. That’s okay. We have to trust that we are doing the best we can with the resources we have. There is another aspect to the Law of Three that not everyone knows. When I point my finger at you while my hand is balled into a fist, I have three fingers pointing back at me. If I am pointing in frustration, I have three fingers pointing back at me to show me where my growth is. I also have a thumb. When I point my finger, which I do rarely now, my thumb is pointing upward. Your hand, raised in frustration in one of the simplest, most common gestures shows you an opportunity for growth. Your three fingers point back at you, your thumb may point upward and only one finger points out at others. Perhaps that is at the heart of where the Law of Three started. I do not know. 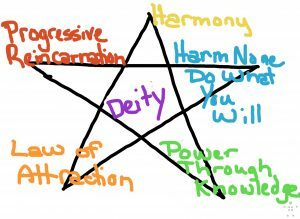 Again, refer to that personal journey and how you interact with the Deity Construct. This is about you and how you choose to interpret the Law of Three. Which leads me to the Law of Attraction. The energy you put out comes back to you. It’s that simple. When you wish to walk in harmony on this earth, that means that you put out balanced energy. It does not have to always be good, nor kind, nor loving, but it does mean that if you practice the Rede, Harm None, that when humans are doing the best they can, this energy will return to you. You don’t have to be wonderful every day, you do the best you can, and hope that others are doing the same. That may not always be true, but we just do our best. Finally, when we consider the basic tenets of Wicca, we believe in living within the natural cycles and in as much harmony as we can with our surroundings and our planet’s natural cycles. Gavin always was a fan of the quote of “Walk in balance on this earth.” It is comparable to ““The Great Spirit is in all things: he is in the air we breathe. The Great Spirit is our Father, but the Earth is our Mother. She nourishes us; that which we put into the ground she returns to us.”– Big Thunder (Bedagi) Wabanaki, Algonquin When we consider harmony, cultural appropriation aside, we must act in such a way that harms none, walking in balance on this planet, finding our way appreciating what makes us all Pagans (country dwellers) at heart. What are the Basic Tenets? These are a loose framework for our beliefs. We are not a rigid, structured path for others to cow tow to some “sage on the stage.” If you have departed from a structured religion, realize that you do not have to import that structure to Wicca or paganism. This may take a moment. In my many years travelling in festivals and in group work, I hear sect-like behavior winnowing out “others” who are not the right kind of Pagan or Wiccan. This is not necessary. Consider how that follows the Rede. Does winnowing out a “bad” Pagan from your group follow the Rede? Does that person have enough knowledge to know that s/he might be a “bad” Pagan? Can you truly be a “bad” Pagan when the term simply means “country dweller?” Can you offer a beginner spiritual growth and empowerment instead of anger and judgement? Just as Wicca is your own spiritual path, you were once a neophyte (beginner) too. Be the best you that you can be sharing your empowerment and your knowledge helping others grow in their spiritual path. Work these tenets for your growth. Walk in Harmony. Remember that the unknowable deity is at the center of it all. Put out the kind of energy you want returned to you. Learn and grow. Be the best you that you can be. Make suggestions for more Wicca words. I have a list at home, but if you have some words that were mysterious to you when you were a neophyte, send them to me!